Dental emergency is a type of medical emergency involving the teeth or gingiva. It is often painful and quite frightening. A prompt treatment is required to alleviate pain and to ensure that the tooth has a best chance of survival. Accidents do happen and knowing what to do when one occurs can mean the difference between saving and loosing the tooth. If you are facing a dental emergency, please call our office at 757-962-7000 as soon as possible. 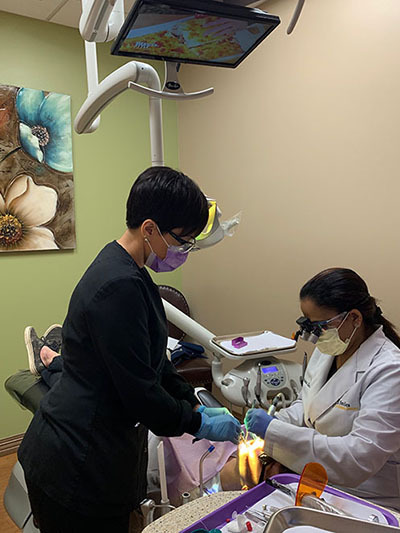 If you are in need of immediate attention after hours, call our phone number and leave a message with our answering services and Dr. Shabana Zahir will respond back to you as soon as possible. If emergency is life threatening, CALL 9-1-1 immediately. Find the tooth. Hold the tooth by the crown not the root and gently rinse off the root of the tooth in water if it is dirty. DO NOT scrub it or remove any attached tissue fragments. If possible gently replace the tooth in its socket and hold the tooth in place. If that isn't possible, put the tooth in a cup of fresh milk or in any emergency tooth preserving product that has ADA seal of acceptance. (eg: SAV-A-TOOTH). The sooner you can do any of these things the better because it helps keep the small attachment fibers on the root of the tooth alive. Call the office as soon as possible, within an hour if you can. Don't forget to get the tooth with you. Rinse the mouth vigorously with warm salt water to clean it out. Use dental floss to remove any food that maybe trapped between the teeth. Do not put Aspirin on the aching tooth or gum tissue because it may cause burning to the gum tissue. If the face is swollen, place a cold compress on the outside of the cheek. Call the office so that we can take care of it. Gently clean the dirt from the injured area with lukewarm water. Apply gauze to the area for 10 mins if there is bleeding. Place cold compression on the face over injured area to reduce swelling. Cover the effected area with over the counter dental cement to prevent sensitivity and take pain reliever. Locate and save any broken tooth fragments if possible. Call the office so that we can take care of it. If a Crown or Filling comes loose while eating, the effected tooth maybe very sensitive to temperature changes and pressure. Apply clove oil to the tooth to alleviate pain. Clean the crown and affix it on to the tooth with over the counter dental cement available at local pharmacy. DO NOT use any kind of glue to cement the crown. If the Crown or filling is lost, smear a layer of dental cement on to the tooth to alleviate pain and sensitivity. Take pain relievers and see us as soon as possible. Clean the area gently with a clean, wet cloth and put cold compression to keep the swelling down. If the bleeding is excessive or doesn't stop in a short period of time (15 mins) or with pressure, call our office or go to a hospital emergency room. Gently try to remove the object with dental floss. If you are not successful, call the office. Do not try to remove the object with a sharp or pointed instrument. The jaw line may appear distorted. Apply cold compression to control swelling. Call our office or go to a hospital emergency room immediately. Loose wires can be covered with wax or gauge until you can be seen by a dentist. If the bracket comes off, make sure to save it and bring it to the office as soon as possible so we can repair it. Place a clean folded gauze pad or cloth or paper towel for the bleeding area. Have the child bite on the gauge with pressure for 15 mins. This procedure maybe repeated. Make sure the child refrains from frequent rinsing. If bleeding persists, call the office so that we can take care of it.